I love to reward my loyal Stampin’ UP! customers and I have introduced a Customer Loyalty Program so that you can earn free stamps with your purchases through my online Stampin’ Up! store here. Every time your order is over $50, you get to check off a box on the Customer Loyalty Program form. When you check off 8 boxes you earn $40 of Free Product from me! Download the form HERE. When your order is $150 or more, you earn FREE hostess benefits from Stampin’ Up! When your order is over $50, you check off a box on the Customer Loyalty Program form! 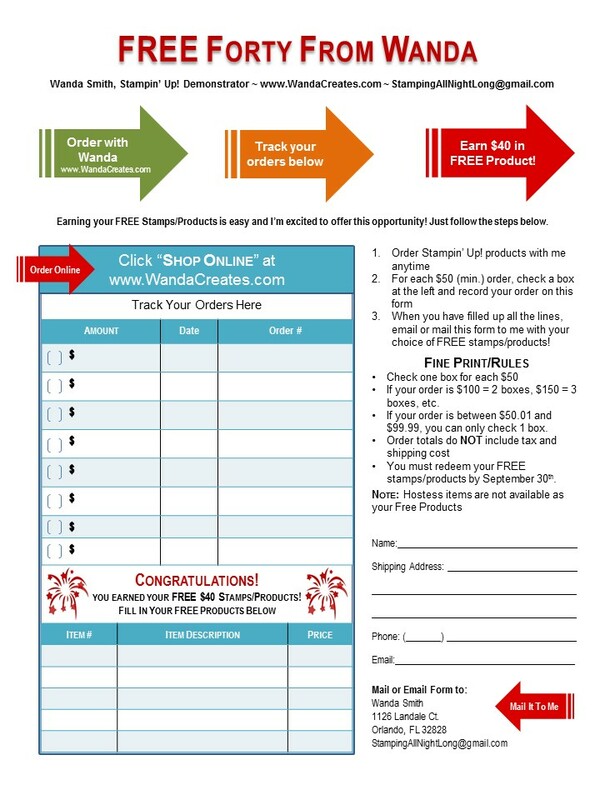 Receive free catalogs from Wanda as my regular customer. As mentioned above all orders over $150 earn FREE HOSTESS $$ to spend any way you want in the catalog! When you place an order online remember to redeem your FREE STAMPIN’ REWARDS before check-out! During Sale-A-Bration Stampin’ Up! holds the of the most exciting promotion of the year, running from January 3 – March 31. Spend $50 (before tax and shipping) choose a FREE product from the Sale-A-Bration catalog! Earn even bigger rewards when you spend $100 (before tax and shipping). Just look for the $50 and $100 reward icons throughout the catalog. Watch for another set of exclusive FREE items in February during Sale-A-Bration. Join my team and get $26 IN free products or join during sale-a-bration and get $76 in free products! Is crafting a big part of your life? This is how you can get a 20%–25% discount on all Stampin’ Up! products plus if you join during Sale-A-Bration you will get $76 in FREE products! Click HERE to find all the benefits of being part of my team!